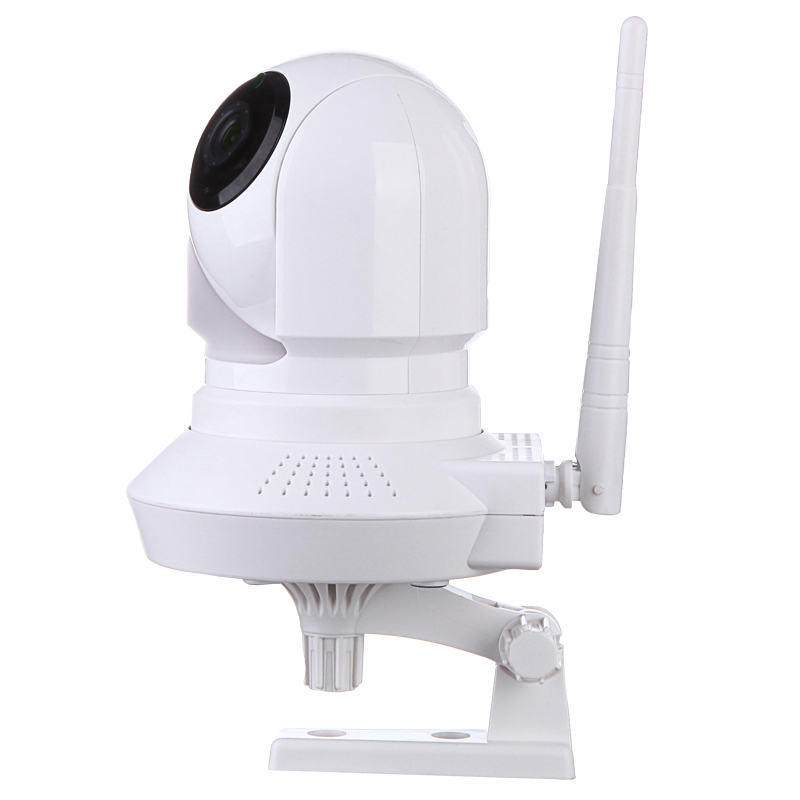 Wireless TCP / IP camera is popular for public security nowadays. On the street, at the ATM, in the store, there are security IP cameras. The development of PC technology, network technology and smart phone technology enable home surveillance easy. IP cameras are popular for home security now. KS-C8131 is such a wifi network home surveillance IP camera. It can be used for home and business remote monitoring. It has smart phone App for easy remote viewing and recording on iphone, ipad, Android or PC. It is PTZ controlled with 355° pan angle, 120° tilt angle. Home and business can be monitored anywhere by smart phone or PC. There are some notes of setting up IP cameras. 1. Set up password to protect private information. There are Admin password and guest password. These two passwords can protect audio, video information security and IP camera configuration security. For surveillance of higher security required places, data encryption for transmission such as https protocol is required. 2. Set PC displayer well to get high quality images. 3. Install IP camera at places with enough illumination. Users can adjust the exposure level of the camera to obtain better illumination. 4. If the IP camera is installed outdoor, then outdoor usage case is required for the camera. Generally, automatic zoom focal length lens are used for outdoor IP cameras. Pet immune motion detectors are required to be installed in house where pet is living. The pet immunity motion detector can identify moving of pet and human. So, it can avoid false alarm caused by pet movement. Security systems manufacturers are adopting new digital technology to make pet immune motion detectors. Generally, there are 2 ways of pet immunity technology. One way is changing design of Fresnel lens. The fresnel lens will refract or reflect Pyroelectric infrared signal to PIR. It will divide the detection area into a number of bright and dark regions. Changing the area division way can reduce the false alarm caused by small pet. But the effective is minimal. Another way to reduce false alarm caused by pet is MCU processing. The MCU will collect the detected infrared signal. Then it compares that with sample signal of human movement. It analyzes the signal cycle, volumn, polarity. If the detected frequency range is 6-12Hz, the system judges an activity as a pet activity and does not generate an alarm. If the detected frequency range is 0-5Hz, the system generates an alarm. There are maximum 15kgs, 20kgs, 35kgs pet immune motion detectors. Home owners should select the corresponding one to fit the pet weight. Correctly installing the motion detector is important to reduce false alarm. There are installation note for pet immune motion detectors. It is required to install the detector according to the manual. There are 4 notes when install the motion detectors. Install the motion sensor at required installing height. Otherwise, the detection distance may be shorten. The pet immunity effectiveness will be decreased. PIR motion detector should be avoid installing at some places where interference may be generated. It is best to keep potential intrusion direction and detection area of PIR as 90 degree. Digital technology is developing. So, in the future, the motion detector will be more intelligent and easy to use.